It has been quite a busy time here for the past two weeks. In addition to midterms, where I had a test, presentation, and paper due all in a row in the same week, some other disruptions decided to make an appearance as well. To start off, for the past 3 weeks, there has been a professor strike across campus. 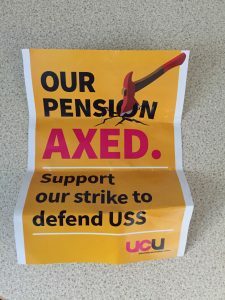 The strike was a result of a decision by the University and College Union and Universities UK disagreement on a new pension scheme, where some professors’ pensions were to be cut drastically. As a way to show their frustration, some professors have gone on strike. Professors who are on strike have cancelled all classes as a result. None of my professors decided to go on strike, but many of my friends have not had lectures, tutorials, or labs for weeks due to it. Some people are leaving a week early for spring break because they have no class! It is interesting for me to experience this and compare it to my own experience with school strikes. When I was just starting middle school, all teachers in my district went on strike over salaries and the first day of school was postponed for two weeks, much to the delight of my anxious pre-teen self who was scared to start middle school. 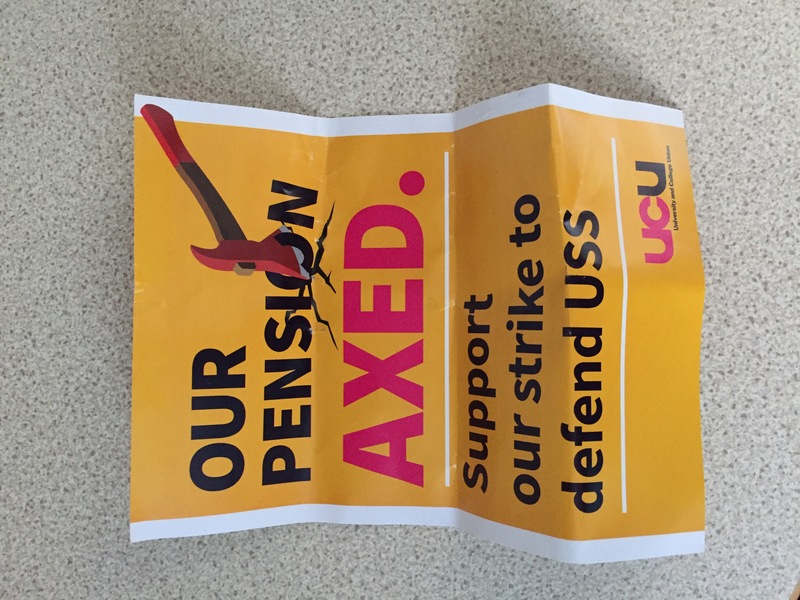 The nature of the strike then is essentially the same thing as what the professors are doing here. They are teaching to educate the talented youth, but need the proper pay in order to be financially stable. Hopefully this will be sorted out soon and a new proposal will be made so that everyone can get back to class. The second big event was the great ‘Beast from the East’ winter storm. 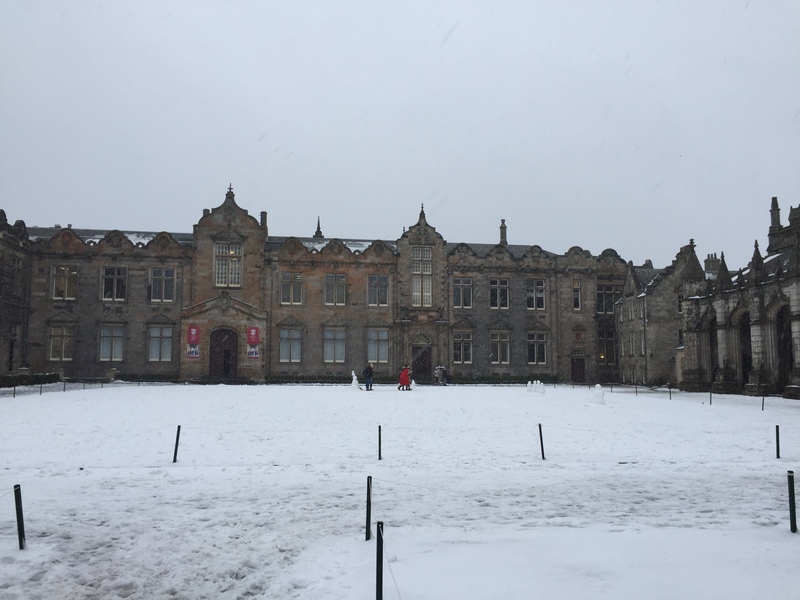 You may have heard about it on the news, but essentially the UK got hammered with snow. 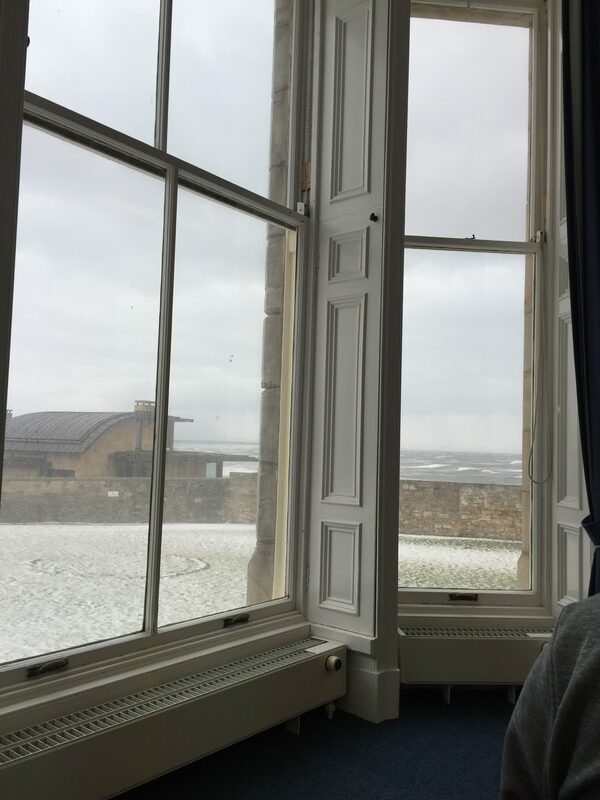 To be honest, it really was not THAT bad of a storm here in St. Andrews, but the wind was another story. 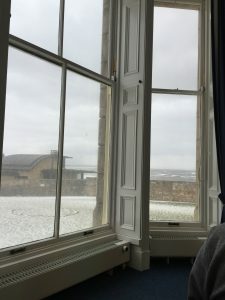 Other places around the UK were hit a lot worse, but we had wind storms of up to 35 mph. We got about 3 inches of snow total over the course of 4 days. Compared to the foot of snow that lasted from December to March last year at Whitman, this was a piece of cake. It was very pretty, until you had to walk to a class that was 20 minutes away and the sidewalks were not cleared. Thankfully, the weekend before the storm, I realized I had no good shoes for walking in the snow or hiking and decided to go buy a pair downtown. I apparently had very good judgement, because the hiking boots I bought literally saved me during this storm! I was able to walk to all of my classes with ease. The school on the other hand, literally shut down. Classes were canceled for one day and all facilities were closed. 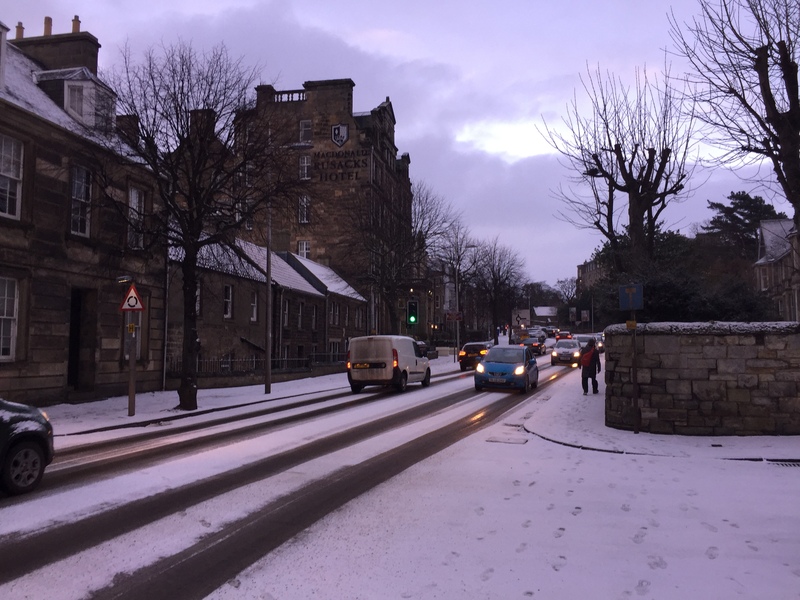 This is unusual weather for St Andrews, so people were scared to drive and did not know what to expect. Even Tesco, the grocery store, ran out of food because everyone was in a panic that they would be snowed in! It was a madhouse trying to go grocery shopping. Thankfully, the snow melted within a couple of days and everything was back to normal. Strikes here are the same as in the U.S. and shows that the education decisions around the world need to be reexamined and improved. Unexpected snow storms happen and you just have to be prepared for anything (even if no one else is). The unexpected nature of these two events have allowed me to see how a different country reacts to similar problems and has enhanced my cultural experience, although not in the way that I expected. Hopefully the strikes will end and there will be no more snow soon! This entry was posted in Uncategorized on March 10, 2018 by erindenney.